In recognition of the fact that far too many people in the Bancroft area cannot afford the wood they need to heat their homes throughout the winter, the North Hastings Community Trust is continuing its Wood Share program. 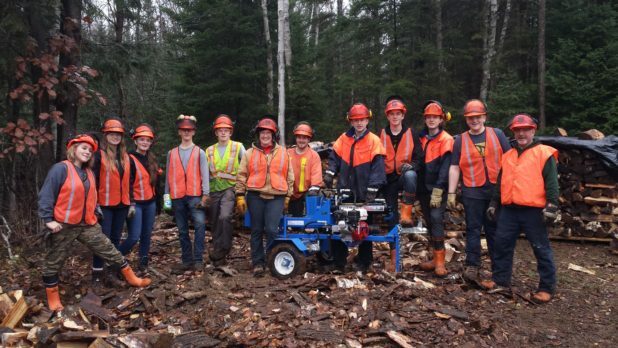 With support from several community organizations and local businesses, the program aims to increase the supply and access to emergency firewood for people living in poverty in North Hastings. As the program co-ordinator and site manager of the program, Larry Edgar has been working hard to make sure everyone in need of assistance heating their home this winter has the firewood they need. Having volunteered with the Wood Share program last winter, he understands how important the support provided by the Trust is to the community. “This program and the ideals of the Community Trust are so important for the success of this community and the people that live here,” said Edgar. This year, Edgar said the Trust has established a mutually beneficial partnership with the students from the North Hastings High School’s NOS program. He said the new partnership has already made a big difference in reducing the workload for the volunteers. “The students have been a great asset,” said Edgar. With six requests for wood and deliveries already scheduled, Edgar foresees a busy season for the volunteers. Because of the high level of need in North Hastings, he said they are always looking for volunteers to help split and stack the wood and assist with deliveries. In hopes of putting the work the NOS class has been doing into context, the Trust’s executive director Jane Kali is planning to talk with the students about the stigma around poverty and what it means to live with a lack of resources. While there she also intends to speak with them about confidentiality and the importance of the work the Trust has been doing in terms of building community. To help create more partnerships in the community, Kali along with members of the Trust recently participated in a training workshop called Building of a loving community for co-liberation that was hosted by an anti-poverty group based in Toronto called BLOOM. She said a significant portion of the program was dedicated to helping participants learn how to make connections with people who think differently than they do. “It was all about expanding our circle, and listening better and being more present,” said Kali. Because the Wood Share program brings together people from different walks of life to assist in each part of the process – splitting, stacking, delivery and acquiring donations – Kali sees it as a good model for expanding the Trust’s other programs which help alleviate poverty. Moving forward, she said the Trust will be looking at the Wood Share program to shift its organizational model away from charity and towards empowerment. Indicating that the new Wood Share site is located behind the Bridge Street Church on Hastings Street North in Bird’s Creek, Kali said people can access the program by contacting the North Hastings Community Trust to see if they qualify. To ensure that everyone’s basic needs are met, she said recipients are limited to a maximum of two loads of wood per winter. For more information contact the Trust by phone at: 613-332-3657; or by email at: nhcommunitytrust@gmail.com.